Continuing our series of reviews of The Hobbit: An Unexpected Journey, TORn staffer Arwen chimes in with this SPOILER-HEAVY review of the action. I suggest that if you don’t want to know about how the story plays out, what the key plot points are, and what happens at the end of the movie, then this review is probably not for you! On the other hand, if you’re not afraid of reading all those things, dive on in! 11 years ago I sat in a dark movie theater watching a “small” film called The Fellowship Of The Ring. As the first images of the Shire started to appear onscreen, a large smile came to my face and tears came to my eyes at the same time. That was it. 11 years later here I was, there and back again, at a preliminary screening of The Hobbit Un Unexpected Journey. 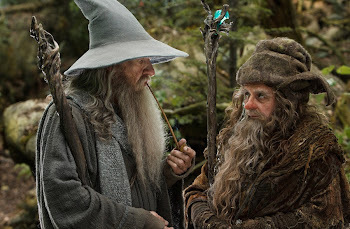 As the familiar titles appeared, the beloved soundtrack started playing, and as Ian Holm’s voice as old Bilbo started to tell the tale of the fall of Erebor, a large smile came to my face and tears came to my eyes, just like that very first time watching Peter Jackson’s first installment of his Rings trilogy. Yes, I was back in this wonderful place created by the brilliant mind of J.R.R. Tolkien and illustrated for the screen by the visionary Peter Jackson… Middle-earth. While some reviewers/critics have complained as Frodo would say that it “feels strangely familiar” I believe fans worldwide will cherish this amazing chance at revisiting Middle-earth. We have been waiting for this ever since we saw the last frame of Return of The King. We didn’t want the journey to end. 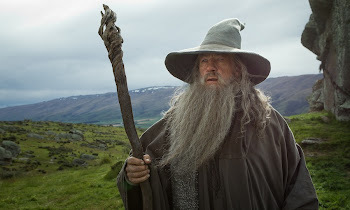 It took over 10 years but eventually we got our wish and now the worldwide moviegoing audience is set to discover what happened 60 years before Gandalf showed up at Bilbo’s door to celebrate his 111th birthday. Some people also had issues with the fact that the tone of the film is “lighter”. Well, it’s supposed to be that way! This is an adaptation of a children’s book, and the mood in this book is very different from the “end of the world” feel found in LOTR. While the filmmakers have made some alterations to the original material the majority of the film remains very faithful to the book. Most of the beloved scenes from the novel are found almost verbatim in the movie. theme which was heard in the trailer. Otherwise Howard Shore brings back all of the famous and beloved Middle-earth musical themes – the Shire, the Ring, Rivendell. Galadriel etc. The acting in the movie is top notch. Martin Freeman shines and is the perfect Bilbo, body, character and soul. We totally identify with him – he’s us in the movie. 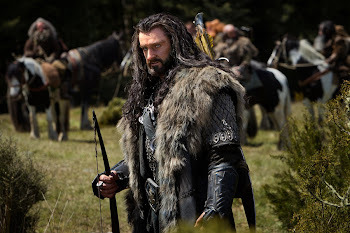 Richard Armitage creates a powerful, flawed and conflicted Thorin. Each of the dwarves is impersonated to perfection by each actor. Sir Ian McKellen once again IS Gandalf. There’s no other way to describe his brilliant performance. There’s a great deal of humor in the film, as was the case in the book. Overall, this is a very good adaptation of Tolkien’s book and a very welcome revisiting of the visual world Peter Jackson introduced us to a decade ago. I think fans and non-fans alike will love it and cherish it for many years to come. As for myself I will want to see it and enjoy it several times! Thank you PJ, Wingnut Films and WB. We can’t wait for the next installment to this new adventure.